Dr. Nicholas Bastidas, board certified in plastic and reconstructive surgery, is well known in the New York City region for his outstanding work with Hemifacial Microsomia surgery. After cleft lip and cleft palate surgery, hemifacial microsomia surgery is the most commonly performed set of surgeries for facial reconstruction. Hemifacial microsomia is thought to occur in the first four to six weeks of a pregnancy when hemorrhage occurs in a developing artery, resulting in a hematoma in the area of the branchial arches of the head and neck. This condition can present in mild to severe forms and can affect several parts of the face. ·Orbit – Underdeveloped or small eyes, vision impairment, an unformed or absent eye, two eyes of different size with normal vision can present. Mandible – Undeveloped or underdeveloped jaw bone on one side, a crooked jaw, abnormal arrangement or missing teeth, limited opening or closing of the mouth may be present. Ear – Small skin tags, a missing or misshapen ear (microtia), absence or underdeveloped ear canal with hearing loss may present. Nerves – The baby may have weak or partial facial paralysis (Cranial nerve VII). 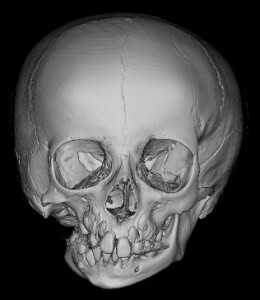 When a baby is diagnosed with hemifacial microsomia, it is critical that parents find a surgeon with whom they are comfortable and who will work closely with them through the necessary corrective surgeries that will take place over a period of several years, based upon the abnormalities that are present. When you contact Dr. Nicholas Bastidas, you will recognize his passion for pediatric reconstructive surgery. His insistence on the use of state-of-the-art technology, including 3D CT scans, keeps him on the cutting edge of reconstructive surgery. Dr. Bastidas is a founding physician in the Institute of Pediatric Plastic and Craniofacial Surgery, a collaboration of physicians fueled by a passion for state-of-the-art care for their pediatric patients who undergo hemifacial microsomia surgery and other craniofacial surgeries. With IPPCS's affiliation with Cohen Children's Medical Center, pediatric patients undergoing hemifacial microsomia surgery with Dr. Bastidas benefit from the strong advantage of dedicated pediatric-focused care provided by a team of multidisciplinary physicians and nurses. When a family is facing the challenges of hemifacial microsomia surgery, they need a strong advocate to walk with them. Dr. Nicholas Bastidas has surrounded himself with a team that shares his focus on delivering safe, high quality healthcare with compassion. If you are interested in knowing more about Dr. Bastidas, visit his websites: www.DrBastidas.com and www.ippcs.org.